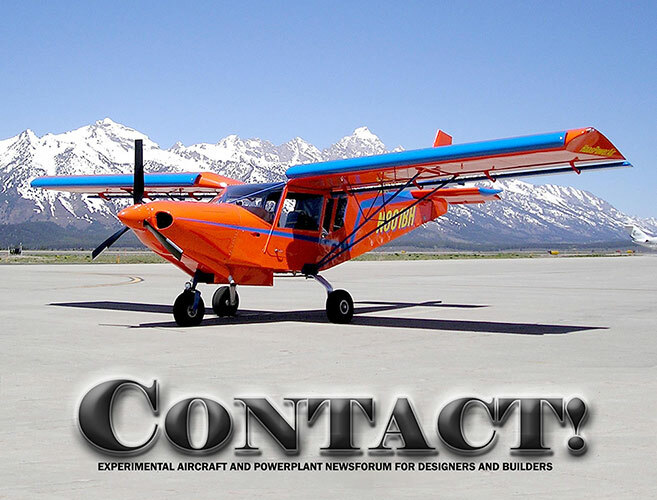 Following is a summary of articles, flight reports and other information published about the STOL CH 801 sport utility kit aircraft in the aviation press. Minnesota Flyer magazine, February 2008. "Start of a Dream... Building my own aircraft," by Terry Croup, pages 10 - 13. Terry reports attending the Zenith factory workshop where he assembled his STOL rudder kit: "Folks, the whole process is great fun. With the pride I felt after building just the rudder I simply cannot imagine what a thrill it will be to have the airplane completed and flying. An aircraft built with my own hands." Kitplanes, April 2006, "You Want Utility? Zenith's 801 Packs 4 Seats to Short Strips: Plus Easy to Build - Only 500 Hours! ", by Dave Higdon, cover story, pages 20 - 25. 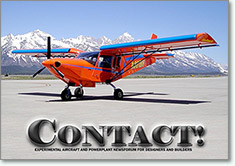 Northern Pilot magazine, "STOL CH 701 and 801 - Form Follows Function", by Peter Diemer, cover story, pages 22 - 29. August / September 2001 issue. Aero-News.net, "Ten Best SportPlanes of 2001"
"...an outstanding airplane by every definition." 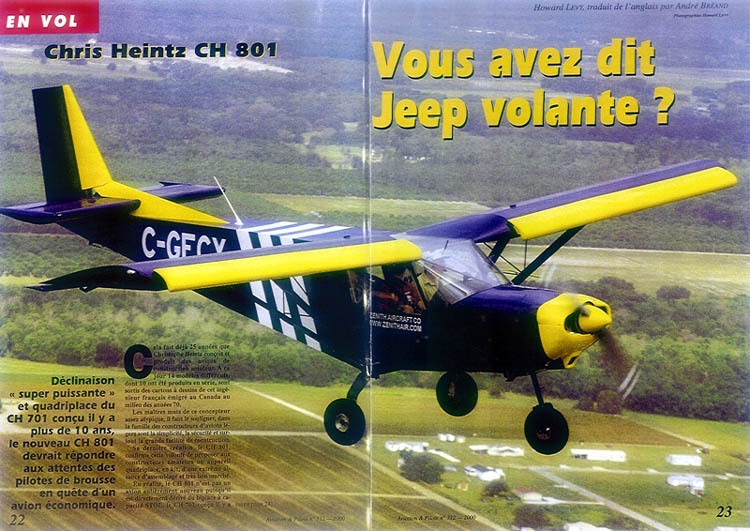 Aviation & Pilote (France), cover story, January 2000, "STOL CH 801 - Did You Say a Flying Jeep?," by Andre Breand. Kitplanes, July 2000, "Homebuilt Haulers," by Ron Wanttaja, pages 24 - 30. "The Zenair CH-801 is an extraordinary aircraft. Sure, its boxy and not nearly as sleek as the latest Lancair, but its got a HUGE 4-place cabin, an excellent stability and control profile, good visibility and the ability to land in areas that other aircraft can barely park in. No kidding, folks, I know it isn't the prettiest belle at the ball, but this little lady can do stuff that will blow you away. I was doing landings last year that barely used 100+ feet (and mind you, I was just learning to fly this particular aircraft... think what you can do with practice) and such capabilities open up whole new worlds that the average Cessna or Mooney will NEVER be able to take you to. If you're looking for something uncommon and you like to play out of little landing strips or fields, you gotta party with this baby. Better yet; this airplane is also backed by a fine company with a solid history (a lot more important a criteria than most realize)." 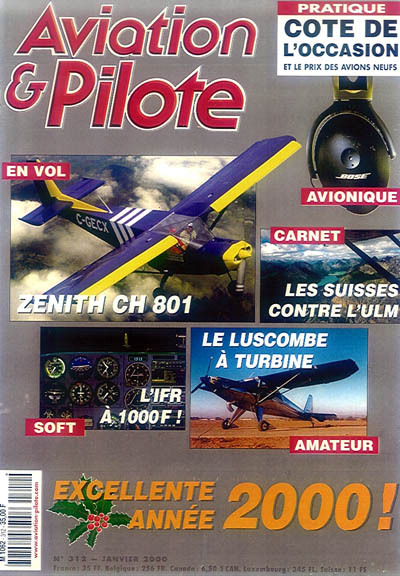 Vol Moteur (France), April 2000, "STOL CH 801," Flight report, by Richard Saint-George, pages 50 - 54. "This excellent 'go-anywhere' plane (or bushplane) has been professionally developed. Its ultra-STOL profile gives it exceptional slow-flight characteristics." 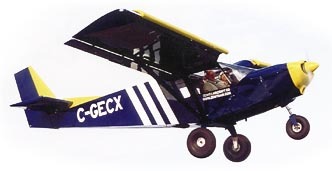 La Brousse (Bush Pilot, Quebec), March/April 2000, "Flight Report: STOL CH 801," pages 40 - 44. EAA Sport Aviation magazine, November 1999. Flight Test Report on the STOL CH 801: "Flying Qualities Report: Utility workhorse - Zenith CH-801," by Ed Kolano, pages 30 - 36. 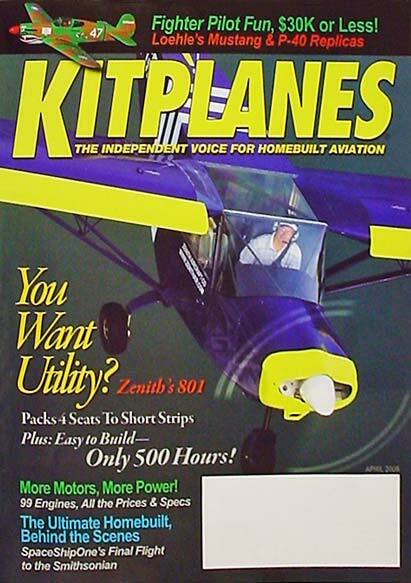 Kitplanes (cover story), November 1999, "BUILD THE NEW ZENITH FOUR-SEAT CH 801: BUDGET BUSHPLANE," by Howard Levy and Dave Martin, pages 60 - 66. CustomPlanes, June 1999, "Zenith Aircrafts New Four-Place STOL CH 801," by LeRoy Cook, pages 34 - 37. Flight report of prototype. Pacific Flyer (Australia), May 1999 (Cover story), "ZENITH STOL CH 801"
Volare (Italy), December 1998, "Lo Zen e larte dello STOL"
The Flyer, 'Zenith unveils CH 801, and a variant on the CH 601 Zodiac", by Jim Cavanagh, August 7, 1998, Page 17. EAA Sport Aviation magazine, April 1998.